When the royal family of Carthya is killed, their deaths are kept a secret in order to give the regents of the kingdom an opportunity to either find long lost Prince Jaron or prove him dead. During this time, one regent (Conner) searches the orphanages of the country and rounds up four orphans that have some resemblance to the lost Prince. Conner wants to train these four boys to be a Nobleman in the two weeks time before the regents meet again to announce the deaths of the Royal family and select a new King. He is hoping that one of these four boys can be transformed into his very own lost Prince. Such a deception would place the boy on the throne with Conner as the true ruler in the background. 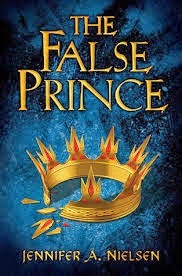 A false prince. The lie of a lifetime, for a lifetime. To pretend to be the Prince in order to be crowned the King, to rule the country and to marry the betrothed princess Amarinda. The boys have other plans. They realize what it will mean to either be chosen or not chosen and so they are making plans to best Conner at his own game. As the ringleader, front runner and all around trouble maker, Sage does his best to make life difficult for Conner and his plan. Nielsen builds a world full of details and well developed characters. Great for readers in 4th grade and above.